The Embroidered Minds Epilepsy Garden aims to raise awareness of epilepsy and the challenges that both sufferers and their families experience today. Craftsman William Morris’s daughter Jenny developed epilepsy in 1876. It carried enormous stigma in Victorian times and had a profound effect on the Morris family. In response to this historical situation the garden aims to raise awareness of epilepsy and the challenges that people living with the condition and their families still face today. Embroidered Minds, a cross disciplinary collaboration was instigated by Leslie Forbes and based around her researches and subsequent novel Embroidered Minds of the Morris Women which explores the tragic ‘conspiracy of silence surrounding William Morris’s family and Jenny’s experience of epilepsy as fiction based in facts. Leslie died in July 2016 following an epileptic seizure but the collaborative project continues as she intended, to challenge ignorance of the condition today. 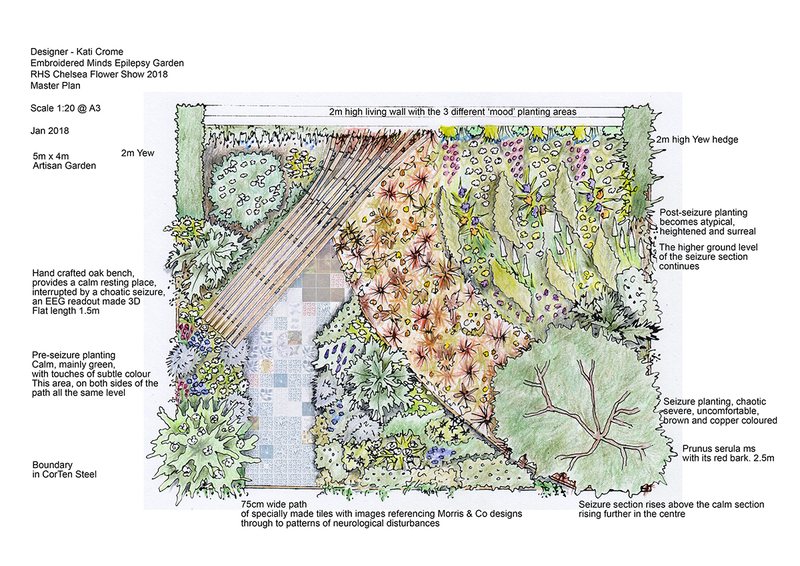 The garden design was initiated by Leslie and old friend Kati Crome and realised by Kati, Leslie's husband Andrew Thomas and other members of the collaboration. Included in the garden are plants often seen in William Morris designs such as Acanthus mollis and Acanthus spinosus and also some which were used as early treatments for epilepsy, including Valeriana officinalis. The garden has three sections representing different lived experiences of epilepsy: first the calm pre-seizure mind; second, the chaotic state of the brain during seizures; and finally, the cumulative effects of unusual neural connections after living with seizures for a long time. 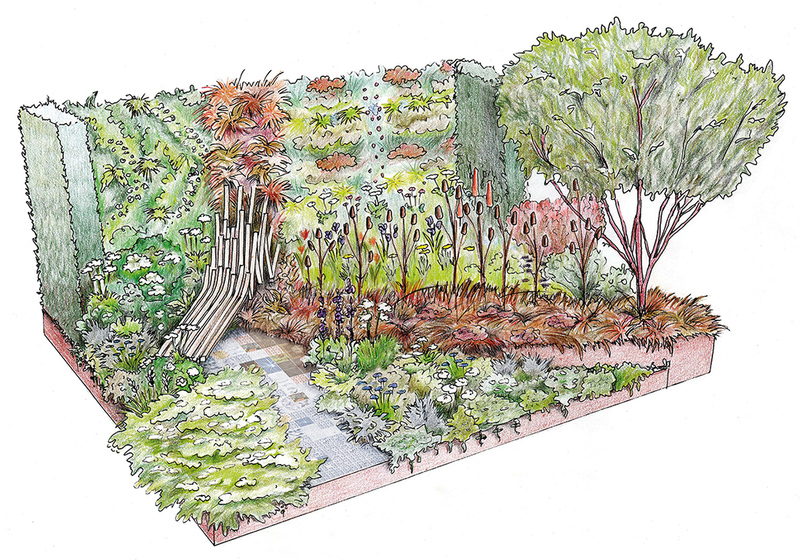 A vertical living wall referencing William Morris designed surface patterns, oak bench, tiled path and foreground planting are interrupted by a seizure represented through planting. The vitality of the post-seizure section also reflects the hope of a brighter future for epilepsy sufferers and their families through greater awareness and understanding of the condition. The oak bench representing an EEG readout, starts as a calm resting place and is then disrupted with the chaos of a seizure. Specially commissioned from furniture designer Toby Winteringham, the bench is created with steam-bent oak secured with copper rivets and supported by rusted steel legs. Running below the bench is a ceramic tiled path designed by artist Sue Ridge and designer/ceramist Andrew Thomas. Based on designs by William Morris the tiles are laid in a disintegrating pattern representing different aspects of epilepsy, transforming into neurological and seizure based images and ‘glitches’ as they run under the chaotic end of the bench. The garden is partly sponsored by Epilepsy Society and Young Epilepsy, with some of the young people resident with Young Epilepsy at their site in Surrey helping to grow a selection of the plants.